Prepare a grill for medium-high heat or heat a grill pan or cast-iron skillet over medium-high; oil grate or pan. Season chicken with remaining 3/4 tsp. salt and 1/4 tsp. pepper. Grill chicken, skin side down, covered, until golden brown and lightly charred, 7-9 minutes. Turn and grill until cooked through and an instant-read thermometer inserted into thickest part of thigh registers 165°F, 5-7 minutes. Transfer chicken to a plate. Brush peach halves with oil. 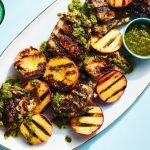 Reduce heat to medium and grill peaches, cut side down, until warmed through, 2-3 minutes.